My daughter brought an article to my attention -- The man who dresses up as his ancestors. She called it a version of genealogy with a Face-off (the tv show) twist. On the show, it is fascinating to see how artists transform models and this is equally true for what artist Christian Fuchs is doing, based on portraits of his ancestors. The process of reinterpreting his ancestors can take many months. Fuchs reads their letters and talks to relatives about them. He takes photos of their portraits to a local tailor who tries to imitate the garments - some of which date back to the 18th Century - as faithfully as possible, and to a jeweller who creates replicas of the jewellery. He really tries to learn about his ancestors so that his recreation is more than just a visual illusion and includes his identification with them. What unusual way have you heard of in terms of someone honoring their ancestors? A few years ago, I visited the U.P. (Upper Peninsula of Michigan for those not in the know), including Sault Ste. Marie. A memorable trip as I almost got a speeding ticket while visiting the area. Fortunately, a kindly cop just warned me to watch for moose as on dark narrow roads they could be found and that typically a speeding car will lose if there is a run in with a moose. Remembering that trip, my radar often notices news from the area. The most recent bit of news is actually of interest to genealogists! Forgotten mass grave in the U.P. finally gets recognition tells how one person, Caroline Grabowski, researched a long-abandoned potter’s field. The article provides stories for many of those buried in this particular potter’s field. Who do you know who has put names to those long unidentified in a cemetery? A first peak video for Season 7 of Who Do You Think You Are? Is now available. · Jessica Biel makes surprising discoveries that change what she thought knew about her heritage. · Julie Bowen uncovers the story of two relatives whose moral codes are from opposite ends of the spectrum. · Courteney Cox traces her maternal line back seven centuries to the Medieval times to discover royalty in her lineage and an unbelievable tale of family drama. · Jennifer Grey uncovers new information about the grandfather she thought she knew, learning how he survived adversity to become a beacon of his community. · Smokey Robinson searches for answers behind the mystery of why his grandfather disappeared from his children’s lives and finds a man tangled in a swirl of controversy. · John Stamos digs into the mystery of how his grandfather became an orphan, and learns of tensions between families that led to a horrible crime. · Liv Tyler learns that her family is tied into the complicated racial narrative of America. · Noah Wyle unravels the mystery of his maternal line, uncovering an ancestor who survived one of America’s bloodiest battles. Which celebrity story are you most looking forward to? The Library of Congress has launched a new World War I collection portal. You can read about it via World War I: Online Offerings. Today we launched a comprehensive portal to its extensive holdings on the subject of World War I (1914–1918) as part of our commemoration of the 100th anniversary of the U.S. involvement in the war. The portal is a one-stop destination page for digitized versions of many of these assets. These remarkable collections include recruitment and wartime information posters, photos from the front, manuscripts and papers of prominent figures such as General John J. “Black Jack” Pershing, newspapers that provided the first draft of the war’s history, maps of campaigns and battle lines, sound recordings of prominent leaders of the era, war-related sheet music, even early film treasures. Along with extensive access to these rare materials, the portal will include links to the online version of the Library’s major new exhibition, “Echoes of the Great War: American Experiences of World War I,” which opens April 4. So much material, so little time! I did spend a bit of time looking into Stars and Stripes: The American Soldiers' Newspaper of World War I, 1918 to 1919 and Newspaper Pictorials: World War I Rotogravures, 1914 to 1919. Which collections caught your eye? Now, for FREE, you can transfer/upload your 23andMe© and AncestryDNA™ results to Family Tree DNA. If you want full full access to all the Family Finder features, there will be a $19 charge. If you have previously tested your autosomal DNA at 23andMe© or AncestryDNA™, you can transfer your results to Family Tree DNA by uploading your raw data file. After transferring your file, your autosomal data is uploaded to our database, but your DNA sample is not obtained by our company. Unfortunately, at this time, you cannot transfer 23andMe© V1 or 23andMe© V2 results. For more information, see our Sample Access and Transfer Policy . What do I get if I transfer my autosomal DNA? After transferring your results, for free, you will receive a list of your autosomal matches from our database and have access to our Family Finder - Matrix. The Matrix feature allows you to select and compare the autosomal DNA relationship between up to ten of your matches at one time. Note: Family Finder is the name of our autosomal DNA test. After transferring, you can unlock all Family Finder features, which include the Chromosome Browser, myOrigins, and ancientOrigins for only $19. Do read the full page for all details. What new matches did you make when taking advantage of this new option? We cannot wait to welcome you to Raleigh, 10-13 May 2017! Here’s a video to give you a taste of what you can expect at the NGS 2017 Family History Conference. 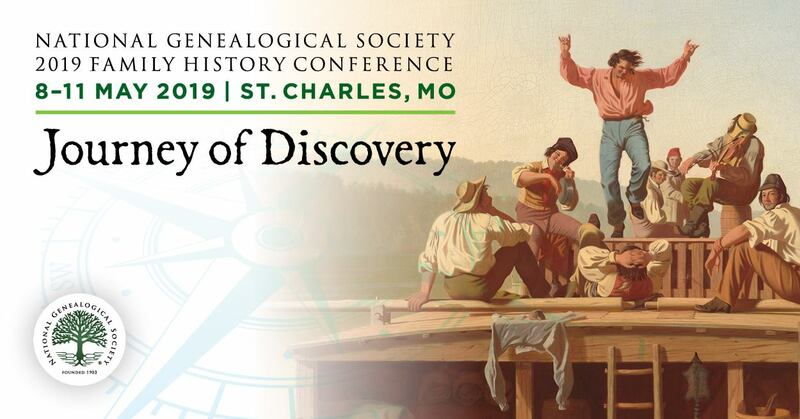 What is your favorite aspect of attending a national genealogical society conference? RootsTech 2017 Session Videos NOW Available – FREE to Access! Videos of select RootsTech sessions are now available for you to enjoy at home. They are organized by day – just click on the day that interests you. Thomas MacEntee has kindly created a list of which sessions were taped for each day. You can access it here on his GeneaBloggers blog. Which presenter cannot you not wait to listen to? What was your favorite talk that you did listen to? Researching UK ancestors? Check out these databases for FREE between now and Monday via this link. What included record collection most intrigued you? Editor’s Note: Apologies for the delay in posting this. Though I had heard the FREE access was coming, I couldn't find the appropriate Ancestry page referring to the sale and I gave up. I didn’t want to lead you astray! I was away from my computer, enjoying the sunshine, and doing non-genealogical stuff yesterday, and today finally stumbled across the appropriate landing page. Enjoy the remaining time with the FREE access, though, I'll be out enjoying the sunshine again! Today (1 February) is #GenealogySelfie Day!